Two children, ages 4 and 5, died in a house fire early Sunday morning in Pomona Park. 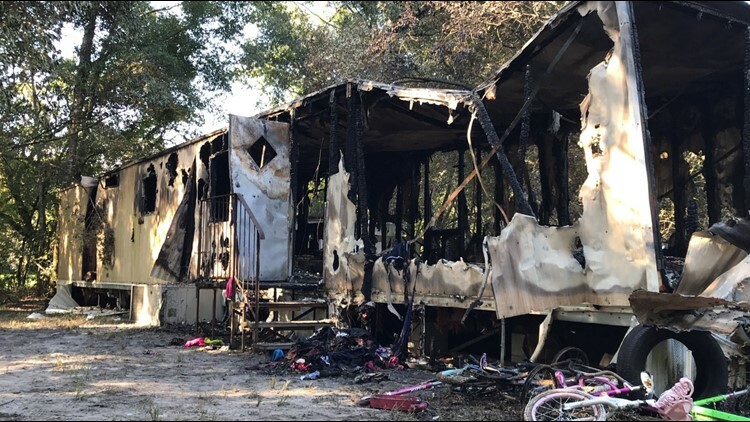 According to the Putnam County Sheriff's Office, fire officials responded to a house fire at 116 New York Lane around 12:45 a.m. Sunday. Upon arrival, officials were told two children were believed to be inside. Unfortunately, the house was already fully involved in flames and inaccessible. Firefighters worked quickly to extinguish the flames. The bodies of 4-year-old Zaden and 5-year-old Na'ziyah were found inside. Kenyetta Whipple's three children were having a sleepover at a relative's home. Not every child made it out. Kenyetta Whipple and Nathar Sharper are holding on tighter to their 8-year-old daughter Nazarria. She was the only one who escaped before the fire consumed the home. “I’m just numb, at a loss for words, it was so unexpected and I just don’t know what to do,” Whipple said. Na'ziyah just started kindergarten this year. She loved Paw Patrol and Dora the Explorer. Her younger brother Zaden loved Teenage Mutant Ninja Turtles. “It was just a blessing waking up with them, putting them to bed. It’s something I’ll miss doing. Every day was a joy with them,” Whipple said. “I never would’ve thought that I would wake up, go to work, come home and that would be the last time I would see my kids. I would say, just hold them, love them, if you’re not doing right by them, do right by them. Take the time out for them because if you don’t you might regret it,” Whipple said. PCSO detectives will be working to assist the state Fire Marshal's Office who will be leading the investigation.